Ted Noah is available! His experience is mainly doing traffic, but he's open to news anchoring and/or weather jobs. He was one of many people let go when the United States Traffic Network went bankrupt. At the time, he was doing traffic for WESH-TV in Orlando. Ready and willing to relocate just about anywhere. Please consider him! See all of Ted's clips. WESH-TV, Orlando: Traffic Anchor/Producer (3/15 - 12/18). Employed by The Unites States Traffic Network and embedded with WESH-TV. Responsible for live traffic anchoring during morning news shows. Also, responsible for various other traffic anchoring shifts, interview anchor segments, editing, writing and graphic production of all live anchor and social media platform content. Constant interaction with viewers via social media. Team player and multi-tasker. Tele-Traffic, Longwood, FL : Traffic Announcer/Data Entry Producer (11/13 - 3/15). Announced traffic conditions via digital platforms for a variety of Florida markets. Gathered and input traffic data for broadcast use of local clients through various sources. Networked with local and state police departments to acquire traffic issues and hazards. Spectrum News 13, Orlando: Traffic Anchor/Reporter (11/10 - 11/13). Responsible for live traffic anchoring during morning news show. Also, responsible for various other traffic anchoring shifts, field reporting for franchise traffic feature pieces, interview anchor segments, editing, writing and graphic production of all live anchor content. Westwood One, Miami: Radio And Television Traffic and News Anchor (8/08 - 11/10). Executed traffic, weather and news reports for many Central Florida and South Florida radio stations. Voice-over traffic for Central Florida News 13 Orlando. Main Traffic Anchor for WOMX 105.1/WOCL 105.9, CBS Radio Orlando. WFLC-FM, Miami: Announcer (7/10 - 12/10). WEAT-FM, West Palm Beach: Announcer, Traffic News Anchor (7/06 - 6/08). Also, morning voice-over traffic anchor for Central Florida News 13 Orlando, Mix 105.1 and all CBS Orlando Radio. Executed traffic, news and weather reports for a variety of Central Florida radio stations. Helicopter television photographer for traffic and breaking news. Cape May County Technical School, Cape May, New Jersey: Communication Arts Technology/Television & Radio Hosting and Broadcast. 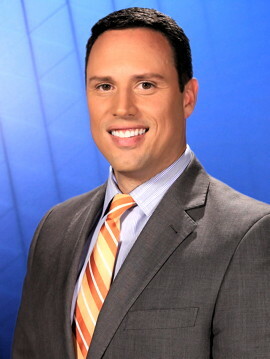 Eric Blackstock, Executive Producer, WESH-TV, Orlando, 804-852-2125. Stephen Chavarie, Real Estate Agent, Orlando, 407-256-7911. Jonathan Graham, Employment Assistant, Temple University, Philadelphia, 610-314-3613.